If you have a photo you want to make into needlepoint, we make custom needlepoint kits to help make your dream a reality. Simply upload the image you want to use on this page by clicking the ‘Upload File’ button on this page to get started. 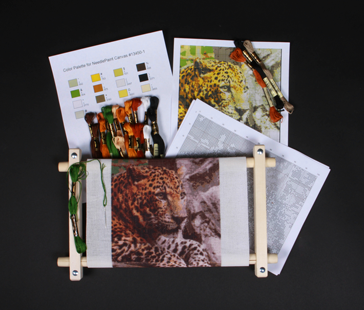 You can adjust the needlepoint kit for the type of fiber you want to use, mesh count, number of colors and even the size. After uploading your photo, you will immediately be able to review it and adjust the kit for your desired number of colors, mesh count, yarn type and canvas size. No payment is required until you are happy with your previewed kit and place your order. If you notice any problems with the preview such as the colors being off or the details not as defined as you would like, email us your picture and notes about what is wrong and we will adjust it per your specifications when we make your order. A designer always reviews all final orders and will contact you with any questions if needed. As a crafter of custom needlepoint kits in Englewood, Colorado, we take your custom needlepoint kitproject very seriously. We guarantee 100% satisfaction for all needlepoint kits and will gladly provide you with a full refund if you are unhappy with your order in any way. Yes, even custom orders can be returned!